Wigs - Her voice was clear and musical, but deeper than woman's wont. 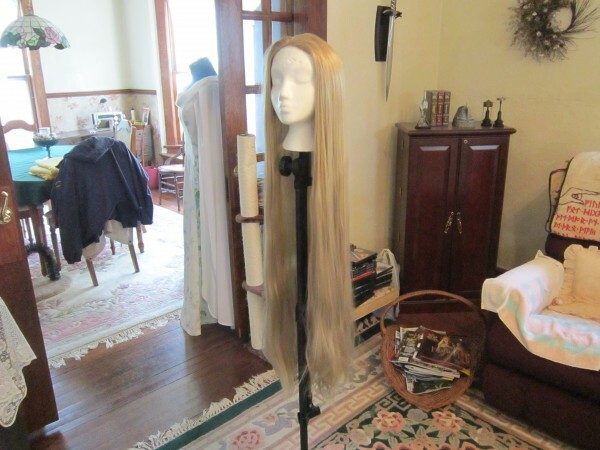 I bought all new Galadriel wigs this year after wearing one for over 16 hours at Dragon*Con, including the Middle Earth dance party. I show up at 3:18. Just look how that wig is sliding back and forth along my back! 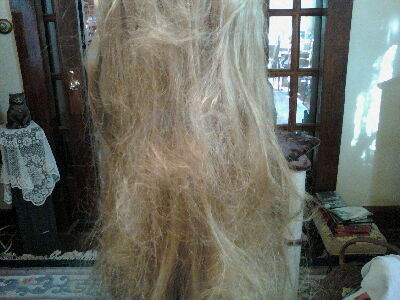 Synthetic hair, skin top. This is not a lace-front wig. I don't need lace front because Galadriel's hair is not brushed back from her face. I bought one for the White Council, LOTR Galadriel, and one for wearing with hoods up. I don't like wearing the same wig for more than one day without detangling it, to minimize the chance it will be ruined (and no more dancing in them). 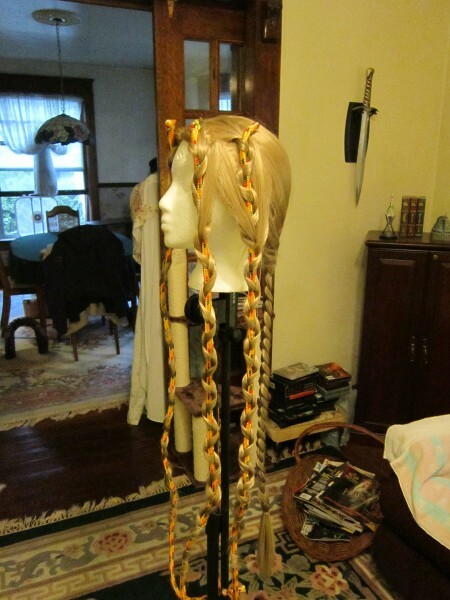 Detangling takes a LONG time, so I don't want to do it at a convention. I am experimenting with different methods of getting curl I want. 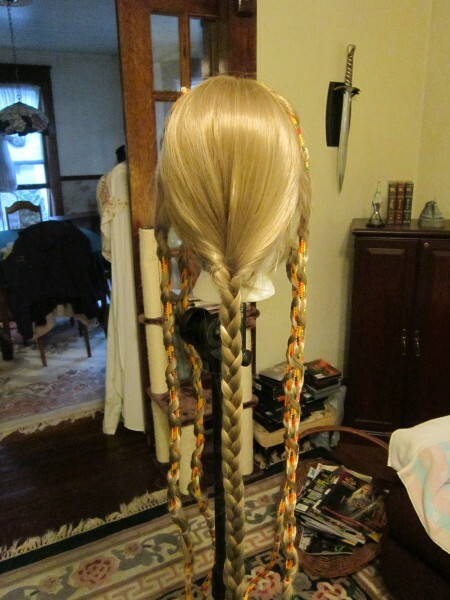 Back is one big braid which will remain in place so hair won't tangle under hoods. Braids have worked in the past (see icon), if I got them in soon enough. I hope two months is enough time! I don't have trouble with them sliding. 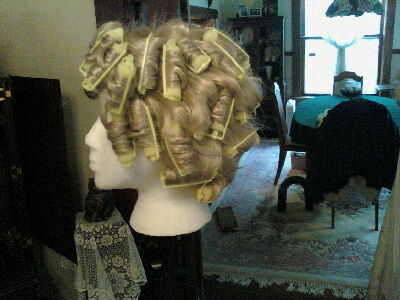 A wig cap and about four bobby pins hold them in place nicely for me. 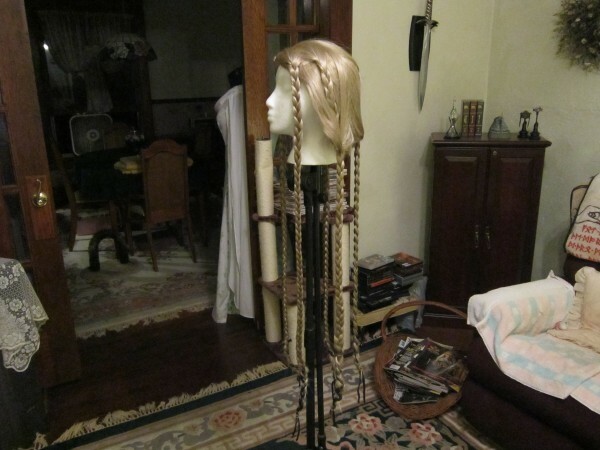 Galadriel's wigs are especially contentious to wear because of the length, the style, and her brooch, which was designed with enough sticky-up things to entangle the wig constantly. They are truly a menace, but I love the look. I also like fooling people. I've sat next to people at dinner in costume and seen them the next day as myself, and they don't know who I am. I'm sure this has happened to you, too, even without wigs! Good costumes are not always comfortable and practical. 3 rules of costume I stick to. -2 i can easily access and use a toilet wearing the costume. -3 must fit in a suitcase.